Founded in 1999, VerticalScope is a privately held corporation headquartered in Toronto, Canada. Specializing in the creation of authoritative websites, online communities, and print magazines for the Automotive, Sports and Technology vertical markets. VerticalScope’s Modified Automotive Group was founded in July 2002, with the premiere issue of Modified Magazine, a performance magazine for sport compact and import car enthusiasts. MAG has delivered strong revenue growth in each year of its existence. The Modified brand is well known and highly respected by both marketers and enthusiasts. Modified Luxury & Exotics Magazine was launched in November, 2004, and caters primarily to the high-end market. Modified Mustangs, launched in October 2005, skews toward a younger demographic. 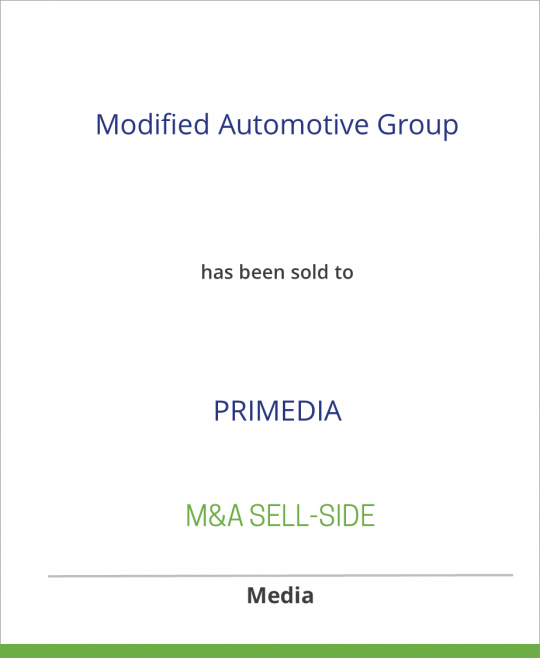 PRIMEDIA is the leading targeted media company in the United States. With 2005 revenue from continuing operations of $822 million, its properties comprise over 100 brands that connect buyers and sellers through print publications, Internet, events, merchandise and video programs. PRIMEDIA’s Enthusiast Media is America’s #1 special interest media company, with more than 75 magazines, 100 websites, 70 events, two television programs, 400 branded products, and such well-known brands as Motor Trend, Automobile, Automotive.com, Equine.com, Power & Motoryacht, Hot Rod, Snowboarder, Stereophile, Surfer, and Wavewatch.com.